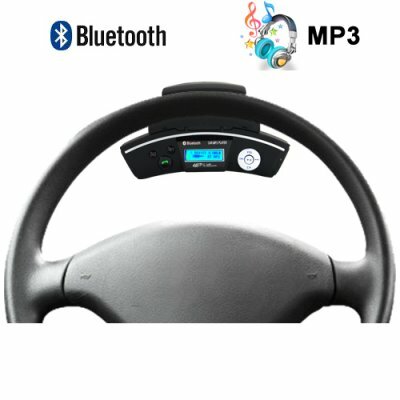 Successfully Added Car Steering Wheel Bluetooth Adapter + Wireless Earpiece to your Shopping Cart. Car steering wheel Bluetooth adapter + wireless earpiece. The safest and easiest way to keep your eyes on the road and hands on the steering wheel while you talk and drive. This versatile Bluetooth device enhances your daily driving experience by making it both safe and convenient to talk while you are on the road in your car, truck, or delivery van. How? By using the built in MIC and speakers or wireless earpiece your phone calls are hands-free, allowing you to keep your eyes on the road while driving. Since the steering wheel Bluetooth adapter attaches securely to your steering wheel via a universal form clamp, it becomes conveniently located where you want it while at the same time not needing any complicated installation procedure. The interface of the CVCJ-B04 is quick to learn and love. Having a clear text backlit display, it is easy to view the incoming phone number and device status. Additionally, there are smartly located buttons for answering an incoming call, ending the call, volume control, and a speaker switch to alternate between using the units built-in speaker or your cars own speakers (through the units FM transmission function). If you have been putting off buying a car Bluetooth adapter because you thought they were just too inconvenient or hard to use, then it is finally time you learn how much easier having a Bluetooth unit can make your daily road commute! For safe, handsfree call management look no further than this excellent car steering wheel Bluetooth adapter. A great wholesale price makes this unit perfect either for the re-sale market, OEM market, or company/personal use. As always, it is available direct to you from the original source for wholesale direct from China electronic products, Chinavasion. Bluetooth hands-free communication to maximize both the safety and convenience of vehicle occupants. Use the built in MIC and speaker, wireless earpiece, or even plug in a wired earphones + MIC - the choice is yours! It is now illegal in Saskatchewan to drive and talk on a cellphone without a handsfree device. I purchased this bluetooth with low expectations, and I was very suprised by the quality and clarity. Pairing was simple. learning the mp3 functions was great. (if you pause mp3's for a long time the mp3 player goes to sleep, great feature!) My only complaint is that there is no voice dial button, and the earpiece makes quite a loud white noise sound when using that feature. I love the ease of use for mp3's and the automatic shutoff. Great product!!! all features working as advertized additionally caller ID feature also a plus point. Excellent product, Good sound / Voice Clarity clear and so easy to set up.